Kiss Contacts Goodbye! Say Hello to LASIK! We’re over. I found someone new… running away to happily ever after with LASIK. I’m tired of spending money on you and getting nothing but hassle and heartache in return. I’m so over our daily morning and evening routine – you are so high maintenance! You make allergy season worse (which I don’t appreciate), are a total buzz kill at the pool, lake, beach, in the gym, on a run, traveling… the list goes on and on. We tried to make it work but we’re just not a good fit – I wish you all the best. Saving $$$: If you wear disposable contacts daily and discard/replace them every two weeks (the most common contact schedule recommended by eye docs) you can expect to pay between $370-$460 annually on contacts and solution. 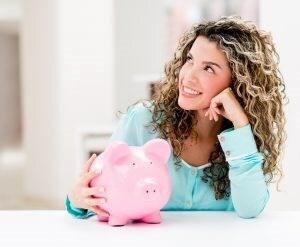 LASIK typically costs around $4,000 total (both eyes) so this means you’re making your cost back in under 10 years and then you’re SAVING money. With payment plans starting at $98/mo or 1 year no interest financing, it’s affordable for nearly anyone. Boom. Hassle: Whether it’s travel, working out, hiking, summertime water sports or basically anything athletic, I hated always worrying about having a spare pair of contacts on hand. Ever lose a contact without a replacement and walk around with one good eye? Yeah, that’s no fun. Or run out of contacts, forced to wear your old backup glasses? I looked like Napoleon Dynamite. Not cute. Discomfort: If you’ve ever had a piece of SOMETHING in your eye with your contact lens you know the frustration. Take it out, clean it, put it back in, oh wait – still there. Allergies, wind… more reasons why contacts are no fun. Usually by the end of the day I just couldn’t wait to get my contacts out. My eyes were irritated and so over it.